International Journal of Research in Health Sciences,2017,5,4,1-5. 1Associate Professor, 2Senior Resident, 3Retired Professor & Head, Department of Surgery, Govt. Medical College, Amritsar, INDIA. Midline incision is the most common technique to access the abdominal cavity in both emergency and elective abdominal conditions. It is simple, gives quick and adequate exposure to all four quadrants with minimal blood loss. The abdominal aponeurosis can be closed by continuous or interrupted sutures after midline abdominal incision. Surgical literature hadn`t clearly defined guidelines for method of abdominal aponeurosis closure particularly in emergency settings. 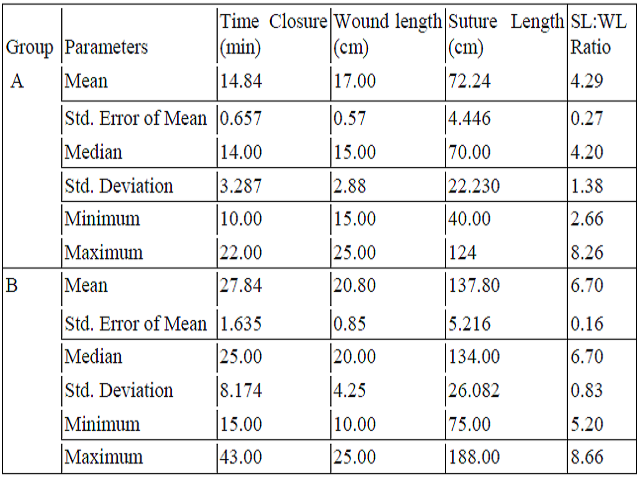 The aim of this study is to evaluate outcome of continuous suturing with interrupted suturing of abdominal aponeurosis in emergency laparotomy of acute perforation peritonitis. Materials and Methods Fifty adult patients of acute perforation peritonitis admitted in the surgery department of Guru Nanak Dev Hospital & Govt. Medical College, Amritsar were studied and divided into two groups of 25 cases each, randomly in continuous closure and interrupted closure of abdominal aponeurosis with prolene suture no 1. The study duration was 18 months from December 2013 to May 2015. Results Continuous abdominal aponeurosis closure is better than interrupted in acute perforation peritonitis because it is fast and economical and wound friendly in terms of lower wound infection, wound dehiscence, burst abdomen, incision hernia and patients felt less wound pain, discomfort and have higher satisfaction index.